This is one outstanding knife that is priced well below what it is truly worth ($100 – but you can pick it up for $70). The Smith & Wesson Spec Ops M-9 Bayonet knife is a top quality blade that is going to be your go to bayonet knife and will put all the previous ones you have ever owned to shame. Now let us not get confused, though, this is a bayonet knife and only got that rating if that is how you intend to use it. If you are looking for a “Rambo” style knife then this isn’t the knife for you. If you are looking for an every day carry knife, then keep looking because this won’t do. No, this knife is made for a .223 Rifle and is intended to be used as a bayonet. As a result, it is not overly sharp but will get the job done. Many soldiers will use this as a tool for shoveling, prying and even in the rare case, as a bayonet. So, therefore, I would only recommend this to active service men and women. As this is a bayonet knife, you would expect the Smith & Wesson M-9 to have a high-quality blade, which luckily it does. The blade features 440 steel which allows you to get it super sharp. Now not razor sharp, as again this is not what it is intended for, but sharp enough to get most jobs done. Furthermore, as the blade is quite hard, it is great for heavy duty tasks and can really take a solid beating without cracking or break under pressure like a lot of other knives would. The point of the knife (the main use of it) is extremely sharp and will definitely get any piercing jobs done and if in the rare chance you are facing an enemy, just the sheer look of it is enough to push them into submission. The back of the blade is also serrated allowing it to be used for other cutting tasks if needed. For a bayonet knife, the M-9 has a really nice handle. Now as they will spend a lot of the time on the end of a weapon, a lot of bayonet-knives do not have the best handles and they are often something that managers will neglect. However, this is not the case with the S & W M9. The handle is made out of black polymer which allows you to get a solid grip and use it quite comfortable for any heavy duty tasks. 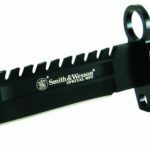 Overall, if you are looking for a Bayonet knife, then stop looking and get your self the S & W M-9. This is a top quality knife and is currently a steal for the price. It is a quite large knife, so I recommend checking it out in store before making you purchase just to make sure that it is right for you.